Randy Reynaldo, CSUN’s director of Administrative Operations, received a prestigious Inkpot Award for Contributions to Comic Art before a panel discussion about his career as a cartoonist and independent comics self-publisher at San Diego Comic-Con 2018. His panel moderator was Barry Gregory, CEO of Ka-Blam Digital Printing. Photo courtesy of Randy Reynaldo. Randy Reynaldo, CSUN’s director of Administrative Operations, received a prestigious Inkpot Award for Contributions to Comic Art before a panel discussion about his career as a cartoonist and independent comics self-publisher at San Diego Comic-Con 2018. Photo courtesy of Randy Reynaldo. 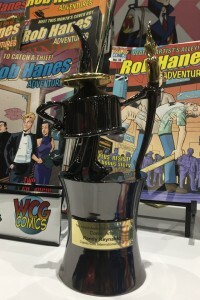 Randy Reynaldo’s Inkpot Award for Contributions to Comic Art at San Diego Comic-Con. Photo courtesy of Randy Reynaldo. 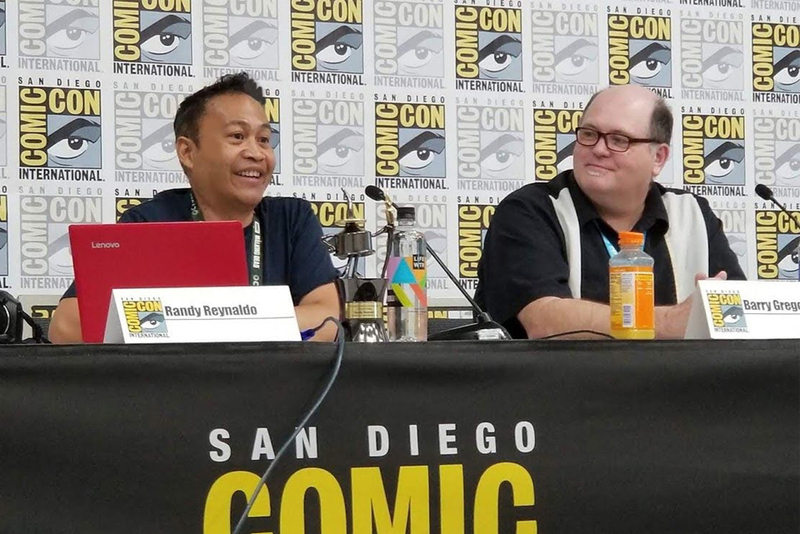 Randy Reynaldo wasn’t sure anyone at the San Diego Comic-Con would even be interested in a panel discussion about his career as a cartoonist and independent comics self-publisher. Two hundred people showed up. And before his packed July 19 presentation at the world-famous weeklong convention for comics, film, television, gaming, and other popular arts, a Comic-Con official surprised Reynaldo with the prestigious Inkpot Award for Contributions to Comic Art — putting him in the rarefied company of previous Inkpot winners Steven Spielberg, Stan Lee, George Lucas and many other giants of science fiction, comics and entertainment. Reynaldo, the director of Administrative Operations in California State University, Northridge’s Office of the President, has a semi-secret identity as a writer, artist, creator and comics publisher, quietly toiling away on his independent series Rob Hanes Adventures, a lighthearted, family-friendly action-adventure series about a private investigator/spy-for-hire. Reynaldo was so surprised by the Comic-Con honor that when he re-joined his family and a few friends in the audience, he told his wife, Sadina, he wasn’t sure he’d mustered any words at all. The Inkpot Award has been presented at San Diego Comic-Con since 1974 to recognize individuals for contributions to the worlds of comics, science fiction/fantasy, film, TV, animation and the catch-all category “service to fandom.” The list of past winners is chock full of familiar names, including including cartoonists, writers, actors, directors and animators. Reynaldo said he believes he received the award as recognition for his longevity and dedication — he’s been publishing about one issue of Rob Hanes Adventures per year since the early 1990s, making him an outlier in an industry where he estimates many small press publishers usually produce just a few issues of any given title. “It’s a recognition for stubbornness,” Reynaldo jokes. 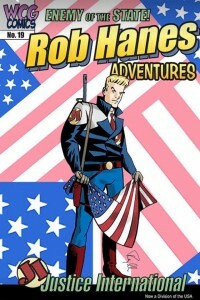 The cover of Rob Hanes Adventures No. 19, the latest issue of Randy Reynaldo’s long-running adventure series. Photo courtesy of Randy Reynaldo. Rob Hanes Adventures is published under Reynaldo’s own WCG Comics imprint. Rob Hanes is “a globetrotting troubleshooter” who works for Justice International, a contractor providing security, intelligence and private investigation services to multinational corporations, governments and private citizens in a series that features ripped-from-the-headlines adventures. The series echoes classic adventure comic strips Reynaldo admires such as Milton Caniff’s Terry and the Pirates and Roy Crane’s Buz Sawyer; the lighthearted humor of Will Eisner’s Spirit is also an influence. Recent popular franchises like Indiana Jones and Jonny Quest, Reynaldo notes, come from the same tradition. Each issue is self-contained. The annual publishing schedule makes cliffhanger stories impractical, Reynaldo said, but the format enables him to experiment with other styles and genres — one issue featured a drawing-room murder mystery (think ​Clue​), another a romance/superhero mashup, and there’s even a baseball story. He considers the publishing a separate life from his day job at CSUN, where he has worked in the president’s office for 25 years — serving five presidents (including interim presidents) — starting as a communications assistant under Blenda Wilson before moving into his current position during Jolene Koester’s tenure. Reynaldo crafts his comics on nights and weekends, scripting each issue, and then drawing and inking the pages by hand — and, finally, using a computer for lettering and black-and-white shading. At this year’s convention, Reynaldo debuted a trade paperback collection of ​Rob Hanes Adventures​ issues 5-8. He also unveiled issue 19, with a storyline inspired by current events: Rob and Justice International are deputized as a new national police force by the recently elected president, Chester M. Humbert, who distrusts the existing agencies of the government. Rob soon lands in the middle of political intrigue as terrorists attempt to detonate a dirty bomb in Europe. This year marked Reynaldo’s 21st Comic-Con appearance as a creator since 1993. Before that, he attended as a fan beginning in the mid-1980s. He was invited to attend this year’s convention as a special guest — a big deal in itself that came with perks such as VIP seating for the convention’s Eisner Awards, considered the Oscars of the comics industry. His panel discussion took place on the first day of the event. 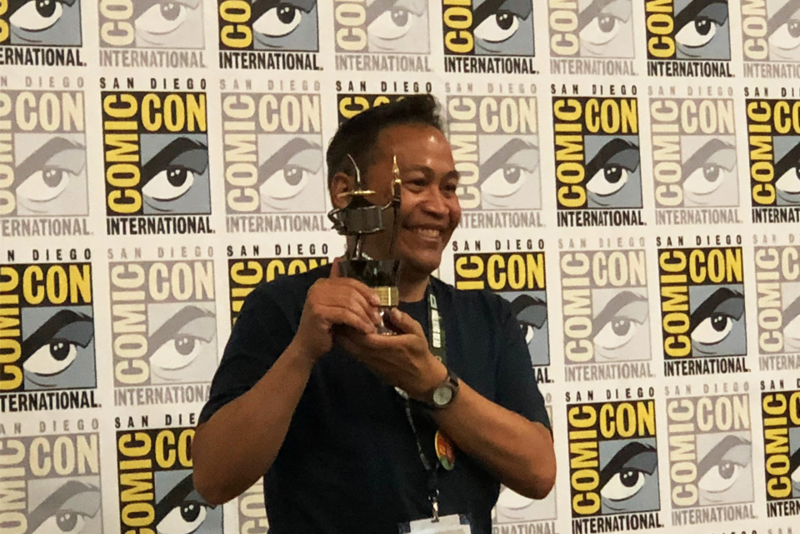 Reynaldo’s selected moderator, Barry Gregory, CEO of Ka-Blam Digital Printing, received a last-minute heads up that a Comic-Con representative would hand Reynaldo the award. The trophy itself is a handsome, heavy thing — an old-fashioned inkpot, shiny black with gold accents, somewhat anthropomorphized with arms to hold a quill pen, and a cap shaped like a sorcerer’s hat. It even came with a cloth to keep it buffed. Initially, Reynaldo has mostly kept the award in his office to show colleagues, though he hasn’t yet made up his mind on its final display location. Now that he’s had some time to let the honor sink in, he’s better able to articulate what the Inkpot means to him.